A few years ago—born out of my inordinate love for this heart-filling, soul-transforming, sacred and transcendent season—I wrote a short Christmas tale called The Truth About Santa Claus. Last year, I offered it here at Creation Point as a cyber Christmas present: my way of wishing all of you who visit this site the happiest of holidays and the most magical of Christmases. I offer it again this year: call it a Christmas rerun. So grab a plate of Christmas cookies, pull a chair up close to the fireplace and enjoy. Here's to a healthy, happy, joyful, abundant, prosperous, peaceful and -- most important of all -- love-filled 2011. See you all in January. The Hunger Site was founded to focus the power of the Internet on a specific humanitarian need; the eradication of world hunger. Since its launch in June 1999, the site has established itself as a leader in online activism, helping to feed the world's hungry and food insecure. On average, over 220,000 individuals from around the world visit the site each day to click the yellow "Click Here to Give - it's FREE" button. Its grassroots popularity has been recognized with Web awards in the activism category — a Cool Site of the Year Award and a People's Voice winner at the Webby Awards. Since its inception, visitors at The Hunger Site and shoppers at The Hunger Site store have given more than 671 million cups of food. The staple food funded by clicks at The Hunger Site is paid for by site sponsors and distributed to those in need by Mercy Corps, Feeding America (formerly America's Second Harvest), and Millennium Promise. 100% of sponsor advertising fees goes to our charitable partners. Funds are split between these organizations and go to the aid of hungry people in over 74 countries, including those in Africa, Asia, Eastern Europe, the Middle East, Latin America and North America. Got that? You click, they feed. Simple, elegant—and something that could only happen in this miraculous Internet Age. If you’re so inclined, click over to The Hunger Site not just at Christmastime—but every day. Back in 1971, John and Yoko took the bare bones of a traditional folk song called "Stewball" and transformed it into a Christmas classic. "Happy Christmas (War is Over)" is a heartfelt mix of clear-eyed Lennon honesty and starry-eyed Lennon idealism. It's also—in my hyperbolic opinion—one of the greatest Christmas songs ever written. So let's officially kick off the Creation Point Christmas Celebration with the video below. And feel free to sing along. Between the celebration of John Lennon’s 70th birthday in October—which included the release of the wonderful Double Fantasy Stripped Down and Ken Sharp’s equally-wonderful book on the making of that classic album—and the thirtieth anniversary of JL’s assassination last week (capped by Paul McCartney singing a memorable medley of "A Day in the Life" and “Give Peace A Chance” on Saturday Night Live), the pop culture world has been in a state of renewed Lennonmania for months now. Seems like the perfect time to chronicle my second encounter with my one true rock and roll hero. Looking back, it’s amazing that I was allowed in at all. Jonny C and I were good friends, of course, but I suspect it helped that we were also songwriting partners (Jon provided the music, I provided the lyrics): a number of songs we created together were part of BOMF’s repertoire and, as a result, we were both under contract to Roy Cicala: BOMF’s manager, Lennon’s principal engineer and the man who ran the ship at the Record Plant. (The contract sounds impressive, but it didn’t lead me to rock and roll fame and fortune. Jonny, on the other hand, has had a long, successful—and well-deserved—musical career.) In any case, on that sunny March day, I skipped my classes at Brooklyn College (something I was in the habit of doing, anyway), hopped the subway into Manhattan and hustled over to West 44th Street, where the Record Plant was located. As I recall—and, in retrospect, it’s fairly astonishing—there was no security detail to pass through: I just walked in, headed straight for the studio and opened the door. There, leaning over the sound board was John Lennon, who looked up, peered over his glasses and said, in that sharp, utterly distinctive Liverpudlian voice, “Is this the place?” I scanned the room, looking for Jonny C—who was my ticket in—but he wasn’t there; so, utterly intimidated (just because I’d encountered Lennon before didn’t mean I was any less overwhelmed by his flesh-and-blood presence), I muttered, “Uh...yeah, it is, but I’ll wait outside...”, closed the door and retreated to a nearby couch. I probably would have sat out there all day if a couple of the BOMF boys hadn’t come by, noticed me and alerted Jon to my presence. And yet as I watched Lennon work, it seemed as if—despite more than a decade as one of the most famous, admired men on Earth—being on camera, the center of all that attention, made him uncomfortable. His attitude, his bearing, wasn’t that of the Clever Beatle, the peacenik sage, the political firebrand: it felt as if he’d retreated into Hamburg John, the young, rock and roll tough guy. It was a subtle thing and there was certainly none of the aggression or anger that often got him in trouble: he was, as expected, charismatic and charming. Still it seemed to me that he was wearing a mask to protect himself and keep the world at bay. In a few short months he’d retire completely from music to concentrate on being a husband and father (by March of ’75 “Lost Weekend” girlfriend May Pang was gone and Lennon had reunited with Yoko, who was pregnant with Sean) and it’s clear—in retrospect, at least—that he was, in fact, sick of "riding on the merry-go-round" (as he sang in "Watching the Wheels") and was preparing for his retreat. Soon he’d be shedding all his personas and reconnecting with the person he’d been before the Beatles. Until then, he’d keep pretending to be some version of Famous John Lennon. Lennon quickly looked me over and then offered a perfect, deadpan Lennon greeting. “Hello, Marc my lyricist,” he said, as if "my lyricist" wasn't a description, but my last name. And then it clicked—and I had my reply. “Hello, John, my hero,” I said. As soon as it came out of my mouth I felt like a total fool. This wasn’t cleverness, this was revealing myself as a transparent Beatles fanboy. I was certain my idiocy would get me ejected from the building, unceremoniously tossed out onto 44th Street and banned from the Record Plant for life. To my immense relief, the group laughed—not at me, they actually seemed to find my answer amusing (or perhaps they were just acknowledging the unspoken fact that they all felt the same way)—but Lennon had an odd reaction. For a moment—just for a moment—he pulled back, as if he couldn’t believe One Of Them had gotten in: another wide-eyed, open-mouthed Beatlemaniac trying to make him into the god he didn’t want to be. He recovered quickly, but I’d noticed—and it underlined the sense I had about how uncomfortable he was wearing the fame he’d been cloaked in since 1964. Soon after that, Lennon and the band went back to work, finishing up the videos. The last bit of filming was of the musicians in the booth, gathered around the sound board, listening back to the tracks. I was hoping no one would realize I was still there and I’d get myself immortalized on film with John Lennon—but Jonny C quickly gave me A Look and I knew I had to retreat. In the end it didn’t matter: the film of that day had been forever imprinted on my mind. A little later, Jonny and I were heading upstairs to the band’s rehearsal room and we found ourselves standing in the elevator with Lennon, who was also heading up. This would have been the perfect chance to say something, anything, else and perhaps atone for my humiliating “my hero!” outburst—but I couldn’t get a word out. The elevator stopped, Lennon went his way and we went ours. As for me, looking back with the wisdom of hindsight, and the knowledge of the tragic fate that awaited Lennon outside the Dakota in 1980, I’m far less embarrassed by what I said to him at the Record Plant that day—and far more grateful. He was my hero and I got to tell him that. That’s not humiliation, that’s grace. PORTALS TO OTHER DIMENSIONS—TEN CENTS EACH! Illustrator and Comic Book Blogmeister Rob Kelly—Lord of The Aquaman Shrine and other wonderful, geek-friendly sites—is putting together a book called Hey Kids, Comics! : True-Life Tales From The Spinner Rack. In Rob’s words, it’s “a book collecting stories from people of all walks of life, all of whom have fond memories of reading, collecting, and/or obsessing over comic books.” I recently finished an essay for Hey, Kids and thought it would be fun to post an excerpt here at Creation Point. Enjoy! I've said this before and it's true: I don't remember ever not reading comic books. I can’t say for sure who first exposed me to them, but I do recall a married couple that lived in my apartment building (the kind of adults you’d expect to be reading comics in the late 50's and early 60's: smiley, rotund, slightly odd people) and they had a treasure trove of comics—stacks and stacks of them—they’d often share with me. 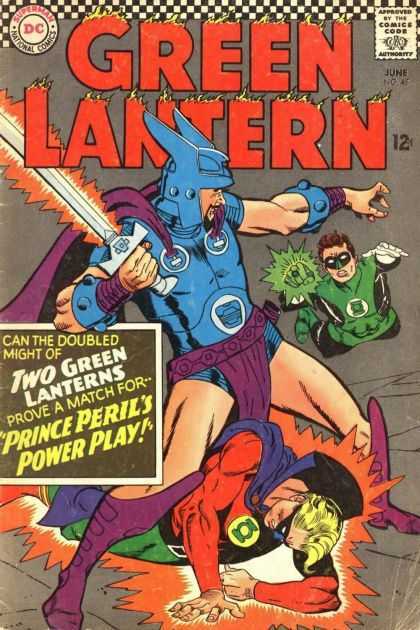 I also remember a cousin giving me what must have been twenty or so comics (to my young eyes, they seemed more like twenty thousand). There was something deeply satisfying in spreading them all out on the floor—like a four-color carpet—not to be read, but to be stared at, studied, absorbed to the deeps of my soul. 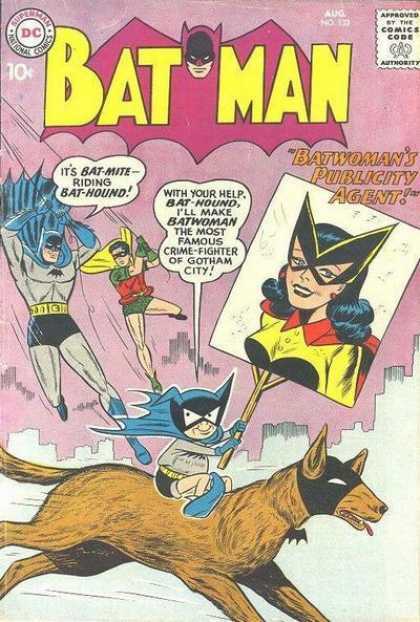 I enjoyed comic book covers as much as I enjoyed reading the stories. I could sit there, in a quasi-hypnotic state, and study the illustrations for hours: they were like cosmic portals, opening up doorways to other dimensions; colorful parallel universes far preferable to the one I inhabited. My family didn’t have much money—we were lower middle class, my father worked for the New York City Parks Department (he was the guy who raked the leaves and shoveled the snow) and my mother was a switchboard operator for the New York State Parole Board—but I never felt materially deprived. My parents were always incredibly generous. And they generously indulged my passion for comics. To my immense relief, the extra two cents didn’t dissuade my parents from buying me comics—and I continued to consume them. It didn’t matter what the comic book was, I read everything—from Hot Stuff and Casper to Sad Sack and Bob Hope (given the current comic book market, it’s astonishing to realize that the Hope series ran for eighteen years. 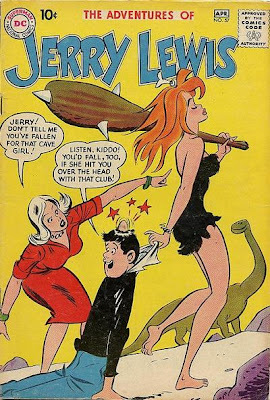 The Adventures of Jerry Lewis lasted even longer). Today the super hero dominates the mainstream market, but, back then, the variety of comic books—all of them kid-friendly—was astounding. Still, to a boy raised on George Reeves flying across his black and white television screen, the DC super hero comics were the Holy Grail. We took it for granted that every male under the age of twelve worshipped Superman and Batman—and most of them did—but each of us had our special favorites. Mine were Justice League and Green Lantern. GL was the perfect vehicle to capture the mind of a child. The concept was as elegant as it was simple: the hero just thought of something—brought his will and imagination to bear—and he manifested it. (Even as an adult the concept still works: I think it’s a perfect metaphor for the way we should all live our lives.) John Broome’s wonderful stories spanned the galaxies—his place in Comic Book Heaven is secure—but, for me, the the primal enchantment came from Gil Kane's extraordinary artwork. Before I discovered the force of nature that was Jack Kirby, Kane was the artist whose work meant the most to me: a mixture of elegance, power and crystal clear storytelling. As noted, drawing was my childhood obsession and one of my absolute favorite things to draw was Kane’s flying figure of Green Lantern, ring-hand confidently outthrust, one leg cocked back (almost as if it was amputated). When I was in Junior High School, I underwent a religious conversion. No, I didn’t suddenly become a Hindu or a Born-Again Christian: I converted from DC to Marvel. I'll end the excerpt there. If you want to read the rest, along with reminiscences by Steve Englehart, Alan Brennert, Mike Carlin, Jonathan Lethem and many more, you'll have to buy Rob's book. I'll be sure to let you know when Hey Kids, Comics! is ready to enter the world. Director Marc Rosenbush is preparing to go into production on his movie version of Blood: A Tale —the graphic novel I co-created with illustrator Kent Williams back in the late 80's—and he's just launched a website to promote the film. If you don't know, Blood is an odd, eerie fever-dream of a story set in an odd, eerie fever-dream of a world. As the title indicates, there are vampires in it, but, beyond the obvious fangs and blood, the story has very little in common with Bram Stoker and Stephenie Meyer. In fact it's like nothing else I've ever written. (When it first came out, my old friend, Vertigo head honcho Karen Berger, called it "an Ingmar Bergman comic book.") When Marc R first expressed interest in adapting Blood for the screen, I was taken by surprise: it's the last story of mine I'd ever imagine being a movie; you might as well try to film my unconscious mind. To his eternal credit, Marc has taken something I thought was unfilmable and turned it into a fascinating, well-crafted—and, yes, commercial—metaphysical horror script that stays true to the heart and soul of the source material. Filming is slated to begin in the summer of 2011 and, if you sign up over at Marc's site, you'll be in on the creative process every step of the way. Guess it's only a matter of time now till Marvel gets going on a big-budget Greenberg the Vampire movie. The biggest underline I’ve ever encountered came in 1988, on my second trip to Meher Baba’s Tomb-Shrine (also known as the Samadhi) near Ahmednagar, India. I’d been to Meherabad for the first time in the summer of 1987 and was planning a return trip the following July. But in early March of 1988 something strange happened: One morning I woke up—abruptly yanked into awareness—to hear a voice: very clear, very powerful, as if someone was in the room talking to me. Only the voice wasn’t coming from across the room, it was coming from inside me. It was coming the center of my chest, from my heart. I don’t recall the exact words, but the message—actually, it was more like an order—boiled down to this: “Come to Meherabad. Come now.” Those words had such force, such impact, that I couldn’t ignore them. Oh, I tried to. There was no way I could just drop everything, get on a plane and go to India. I had work, I had obligations. Even if, by some miracle, I could go, the ashram where most visitors to the Samadhi stay during their pilgrimage was only open until March 15th. (After that, the Maharashtra heat becomes unbearable. The Meher Pilgrim Center doesn’t reopen till the end of June.) If I was going to travel around the world, I’d need to stay for at least two weeks, not swoop in and out like some spiritual lunatic. Nope, no matter what that voice was, no matter where it came from (a passing angel, my unconscious mind or Meher Baba Himself), I was ignoring this order. But the thing is I couldn’t ignore it. It was as if the order itself contained the ability to execute it. As if each of those words, spoken in my heart, were energy-eggs that cracked open and provided the strength and will for me to (with seeming effortlessness, I don’t recall there being any blockades along the way) rearrange my life, race to the Indian Consulate for a tourist visa, buy a plane ticket and—within a few days—fasten my seat belt for a journey to Bombay (which, for the record, didn’t become Mumbai till 1995). So up the hill I staggered, into the Samadhi I went. But there was no love-bomb waiting to engulf me, no warm arms waiting to envelop me. The instant I rested my head against the cloth-covered marble, it was as if a Cosmic Hand sliced open my mind, reached in and untapped a psychic geyser that had been waiting years to explode: all my self-loathing—every wretched program that told me I was small, insignificant, unworthy, a hopeless waste of space on the planet—erupted up and out, wave after wave of psychic sludge: pitch black, oily and utterly repugnant. I felt poisoned, toxic, as it flooded every cell of my body, every corner of my soul, washing away all other thoughts and feelings, every other aspect of Self, until all that remained was the Black Sludge of Unworthiness. How bad was it? I remember noticing a bug crawling across the Tomb floor and feeling that the only difference between us was that the insect had more of a right to be alive than I did. Devastated, I staggered out of the Samadhi and down to my room. wondering why the hell I’d dropped everything and raced across half the world only to be spiritually ambushed by a God who suddenly seemed less-than benevolent. Once I was rested, free of jet lag and psychic aftershocks, I began to understand what had happened. I’d been with Meher Baba long enough to know that one of His methods is to shine a light on the shadowed corners of the soul, corners we’re often not even aware of, peeling back the hardened layers of psychic excrement that cover up the Divinity we all are. Magnifying those aspects and dragging them to the surface of our minds allows us to work with them more directly and, ultimately, dissolve them in the light of awareness. By letting me see the Black Sludge in its full, flowering ugliness, Baba gave me the tools to deal with it in a conscious way. Twenty-two years later, I can’t claim the Sludge is gone—I suspect that, being human, I’ll always carry echoes of it, sometimes faint, sometimes loud—but, since that day, it’s certainly diminished in power. But perhaps it hasn’t diminished: perhaps it’s just transformed. I woke up—not just from sleep, but into myself. To who and what I really am. To my true height, my true power. This wasn’t just an intellectual knowing, this was a visceral experience, an inner vision that touched a deeper reality. I could see and feel that height, that power—I was that height and power—and it was far taller, far mightier, than anything I could have ever imagined: like looking down at all Creation from the highest rung on Jacob’s Ladder. I can’t say how long the experience lasted, maybe just a few seconds, maybe a few centuries, but looking at the universe, and at myself, from that extraordinary height became so dizzying, so overwhelming, that it actually frightened me. But the memory didn’t. I’ve held tight to that vision, that gift of grace, and treasured it all these years, knowing that my job—no, not my job, my pleasure—is to grow into the height and power that I already am. Looking back, I see that what I was shown was just what I could handle at the time. It was only one small hint of my true height. Jacob’s Ladder extends up into infinity (and beyond, as Buzz Lightyear would say)—and I can, I must, continue to grow with it. Understand, please, that this experience wasn’t unique to me. It became very clear that this is the height we all truly are, the divinity that lives and breathes within every last one of us, if we could only see it. And, yes, that includes you. So when the Black Sludge comes calling, remember: take a deep breath, grow tall. And don’t be afraid to look down. Watch this—and be humbled and amazed and inspired by the Infinite. And ponder this: What if all those galaxies out there are just reflections of the galaxies within us? How limitless are we really? How powerful? If you're in the New York City area this Thursday, November 11th, you might want to drop by one of the very best children's book stores in the country, Books of Wonder, where I'll be appearing—along with an impressive group of fantasy authors—from 5 to 7 pm. I'll be signing copies of Imaginalis and, I suspect, reading from the book, as well. Books of Wonder, if you don't know, is also the company that publishes those miraculous facsimile editions of L. Frank Baum's Oz books. They've got lots of other Oz-related goodies, as well. (This time next month, I'll once again be hanging some of their limited edition, hand painted Oz ornaments on my Christmas tree.) If you can't make it to the signing, then absolutely check out the B.O.W. site. See you in the Emerald City, I hope. The fact that something has not happened doesn’t mean it cannot happen; it only means the way to make it happen is as yet unknown. As someone who believes that the (apparent) limits of the possible exist only to be exploded—as that quote over there on the left attests—I was delighted to come across such a powerful reminder of a truth I already know, but still, for all my efforts, sometimes forget. In my book Imaginalis , the main character, Mehera Crosby, is guided on her adventure by words that many would dismiss as childish imagination: “Because it’s impossible, I’ll do it. Because it’s unbelievable, I’ll believe.” To me this isn’t an immature world view, this is the essence of our existence. For all the strangeness and suffering life can offer, it’s been my experience that we truly inhabit a universe of magic and miracles—one universe in a simultaneity of universes that we step into and out of with more frequency than we realize—and the more we acknowledge that, the more we realize that the sky isn’t the limit, that the only real limits are in our own heads, the more that magic will come alive for us. Respond to us. Transform the world within and around us. Just because something hasn’t happened doesn’t mean it can’t. If we keep our eyes wide, open to the endless impossibilities the universe has to offer, the miracles will come. Feel free to remind me of that if I forget again. And I hope, in some small way, I’ve reminded you. I’d been under-the-weather earlier in the week—so much so that I had to cancel a trip to the Ottawa International Writer’s Festival—and was just starting to feel better. My wife and I were out taking an afternoon walk, enjoying the fall weather, when I felt the beginnings of an allergic reaction: face itching, red bumps forming on my face. Well, I’ve got a host of food and environmental sensitivities that often seem to kick in without warning, so this wasn’t all-that surprising. What did surprise me was the speed with which the reaction spread across my entire body. By the time I’d reached my front steps, I was itching violently, covered in hives, the universe was spinning way too quickly and my vision was blurring. Shortly after I staggered inside, I passed out (apparently my blood pressure had taken a precipitous dive): I remember looking at my wife just before I descended into the Twilight Zone and she appeared to be standing at the wrong end of a telescope. With her usual skill and determination, Diane managed to bring me around and, before I knew it, a band of angels, in the form of EMTs, had arrived to rescue me from the demonic depths: I soon found myself on a stretcher, hooked up to an IV, taking my first-ever ride in an ambulance. I ended up in the hospital overnight, body pumped full of Benadryl and steroids, the whole thing feeling like a Halloween hallucination of the first order. I’ve been home for a few days now, still not quite right (for someone like me, ultra-sensitive to medications, the cure can sometimes be as bad as the disease), but certainly feeling better. The strangest part of it all is that I can’t, for the life of me, figure out what caused the reaction: I hadn’t eaten anything I’m allergic to, so my best guess is that there was some mutated mold lurking in a pile of autumn leaves, waiting to spring on the first biologically-vulnerable writer to pass by. Either that or it was a genuine Halloween ghoul, arrived early to the party, ready for mischief. In any case, the doorbell’s ringing, and a far friendlier class of spirit is on my porch. I’m happy they’re here. That other ghoul can stay away forever: Begone! Happy Halloween to one and all. Briefly, could you give me a rundown of your Spider-Man writing credits? I started with Spider-Man way back in the early 80’s, doing a long run on Marvel Team-Up with two terrific artists: Herb Trimpe and Kerry Gammill. Not exactly a classic run on my part, but, hey, we’ve all got to start somewhere. A few years later, I came back to Spider-Man for the six-part Kraven’s Last Hunt storyline. I followed that up with the one-shot sequel, Soul Of The Hunter. Then, in the early 90’s, I did a two-year run on Spectacular Spider-Man, followed by a lengthy run on Amazing Spider-Man, and then back for another couple of years on Spectacular. Along the way, I did lots of mini-series, fill-ins and back-up stories. Too many to mention here. What is it about the character that appealed to you as a writer? What made you stick around through various editors and titles? I was always amazed at the way Spider-Man kept pulling me back. I’d quit one book, thinking I never wanted to write another Spidey story again, then an offer would come along and I’d jump at it. Why? Because I missed Peter Parker. He’s a wonderful character: deep, interesting, funny, intelligent, decent, and wonderfully conflicted. And that’s without the costume on! Who was your favorite Spidey villain to write? Least favorite? Finding new psychological wrinkles in the villains was one of my favorite things to do. Kraven stands out, of course. He was a character that was pretty much written off as a joke before Kraven’s Last Hunt—so it was terrific to develop him into a truly memorable bad guy...and then kill him off. I also enjoyed probing into the psyches of the Vulture, Electro, Mysterio and, my absolute favorite, the Harry Osborn Green Goblin. The relationship between Peter and Harry (both in and out of costume) fascinated me. I think that the story in Spectacular Spider-Man #200, in which Harry dies, is the best Spider-Man story I ever did. We’d been building to that story for nearly two years...and I’m very proud of it. What were your thoughts on Spider-Man’s supporting cast? Do you think it needs reinvigorating, fine as is? Which characters did you enjoy dealing with? I think the character I enjoyed most was (believe it or not) Aunt May. At the time I was writing Spider-Man, many writers and readers weren’t that interested in her. She seemed to be a bland old worrywart; but from the first time I wrote her, I found May to be a woman of incredible intelligence, passion and, most of all, strength. The story in Amazing Spider-Man #400, where Aunt May died in Peter’s arms (hey, I’m beginning to see a pattern here), is another of my all-time favorites. But I wrote a number of Aunt May stories where I got to explore her from new and interesting angles. Is there anything you would change in your previous Spidey work if given the chance? Well, maybe I’d go back and rewrite a bunch of those Marvel Team-Up stories. And I’d like to see the Clone Saga rewritten to reflect our original intentions. But, no, I wouldn’t even do that. For good or ill, all those stories were the very best I could do at the time. As for the rest of it, there was an occasional turkey among the bunch, but, overall, I’m extremely proud of my work on the various Spider-Man titles. I think it’s some of my very best. If you got another crack at writing the webslinger, what would you like to do with him? I’ve written so many Spider-Man stories that I don’t know if there’s anything I could do with him! I think I did everything I wanted to do. Doesn’t mean I won’t wake up tomorrow morning with a fantastic idea... but right now, I certainly don’t have one. What were some of your favorite story arcs that you worked on? Any particular artist that you were paired with that you felt a strong connection with? Other stories that come to mind are the Lost Years mini-series I did with John Romita, Jr. (I loved Ben Reilly and Kaine...they were great characters...and I’m still sorry they're gone.) And one of the highlights of my entire career was a story called “The Kiss” that I wrote as a back-up in the first issue of the short-lived Webslingers book. It was illustrated by one of the giants of our industry, John Romita, Sr., at the very top of his game. Romita was the artist on so many of my all-time favorite Spider-Man stories...and working with him was not just a thrill but a genuine honor. There you have it. If the person who interviewed me is out there reading this, please post a comment and let me know when we did this...and what publication it was intended for. I’d love to solve this mystery. After a couple of very enjoyable years as editor-in-chief of Ardden Entertainment—working on Flash Gordon, Casper and the Spectrals and the recently-announced Atlas Comics revival—I’ve decided to take my leave. It’s been a great ride building this new company with Ardden co-publishers Brendan Deneen and Rich Emms—both of whom, I hasten to add, are terrific guys—but, as we’ve all worked together to prep the Atlas material, co-creating the new versions of Grim Ghost, Phoenix and Wulf the Barbarian, it’s become clear that we have different visions of how to proceed. After pondering long and hard, I decided the best thing would be to put on my parachute and exit the Ardden Tower, leaving the Atlas revival in Brendan and Rich’s very capable hands. It was fun flexing my editorial muscles, seeing the comics world from the other side of the desk, and I may do it again one of these days. I wish Brendan, Rich and Jason Goodman’s Atlas team great good luck with the new books. And, to mark the occasion, here's one of the greatest Lennon tracks of all. "We all shine on," indeed. Believe it or not, I have never seen this before. So thanks to Brian, the man called Matchstick and the magic of the internet for providing the perfect afterword to the saga of Cody Sunn-Childe and Wally Lombego. This Friday, October 8th, kicks off the 2010 New York Comic Con. I was hoping to be there, but plans have changed. That said, NYCC is a big, noisy, wonderful convention (not yet as big and noisy as San Diego and far more comic book-centric), so if you’re in the New York area, and you love comics, you owe it to yourself to go. Friday the 8th is also the day my next episode of Batman: The Brave and the Bold airs. This one features the Doom Patrol and I'm incredibly pleased with the way it turned out. A word of warning: The story skews a little darker than the average B & B episode. As they say: parental discretion is advised. You can catch the show on Cartoon Network, Friday night at 7 pm. October 9th is John Lennon’s birthday—my one true rock and roll hero would have been seventy—and this seems like the perfect opportunity to post the second part of my “Meeting Lennon” story. (You can read part one here.) I can’t promise I’ll make it by Saturday, but I’m aiming to post the story within a week of the big day. If I blow that deadline, feel free to harass me about it. A number of critics—and the film makers themselves—have called the story of Mark Zuckerberg and the creation of Facebook a modern-day Citizen Kane . Here’s the big difference I see: although Welles based elements of CK on the life of William Randolph Heart, he didn’t pretend to be presenting a factual account of Hearst’s life. And he certainly didn’t call his character W.R. Hearst. By giving us an account of Zuckerberg’s life that is presented as a work of rigorously-researched non-fiction—Sorkin, in particular, is promoting it this way, despite many people pointing out the gap between movie-reality and the true story—the whole thing feels just a little...creepy. Whatever the facts, this film will define Zuckerberg in the public mind for years to come. However much I enjoyed The Social Network, I think I would have preferred a film about Charles Foster Zuck. My previous post about Kraven’s Last Hunt —and the Russian origins of Sergei Kravinov—brought a flurry of comments about my literary idol, Dostoyevsky, whose work inspired my interpretation of Kraven the Hunter. This, in turn, reminded me of a 1940’s radio adaptation of Dostoyevsky’s Crime and Punishment that I heard a few months back: a wonderful—if wildly-truncated—version of the story that appeared on a show called Mystery In The Air. It starred Peter Lorre (who also starred in the 1935 film version) and you can download it, for free (and, yes, it’s perfectly legal), right here. The study...took place in 1979 and was, in its way, a feat of canny stagecraft. In an old monastery in Peterborough, N.H., Langer and her students set up an elaborate time capsule of the world 20 years earlier, then sent two separate groups of men in their late 70s and early 80s to spend a week there. Each group spent the week immersed in the year 1959, discussing Castro’s advances in Cuba and the Colts’ victory in the NFL championship, listening to Perry Como and Nat King Cole, watching “North by Northwest” and “Some Like it Hot.” The only difference between the two groups was that one talked about the year in the present tense - they were pretending it was 1959 - and the other group referred to it in the past. Before and after, the men in both groups were given a battery of cognitive and physical tests. What Langer found was that the men in both groups seemed to have reversed many of the declines associated with aging - they were stronger and more flexible, their memories and their performance on intelligence tests improved. But the men who had acted as if it really was 1959 had improved significantly more. By mentally living as younger men for a week, they seemed actually to have turned back the clock. Time travel indeed. Something for all of us to think about and, if you’re inclined, discuss right here at Creation Point. In response to a request from Creation Pointer Ken Fries, here—straight from the long-lost Amazon Blog Archives—is the story of how Kraven's Last Hunt came to be. Enjoy! Why should that excite me so? One word: Dostoyevsky. When I read Crime and Punishment and The Brothers Karamozov in high school, they seeped in through my brain, wormed their way down into my nervous system...and ripped me to shreds. No other novelist has ever explored the staggering duality of existence, illuminated the mystical heights and the despicable depths of the human heart, with the brilliance of Dostoyevsky. The Russian soul, as exposed in his novels, was really the Universal Soul. It was my soul. It was 1980 and I was very new to comics: I’d written a number of stories for DC—mostly for their anthologies—and a few for Gold Key, but I was just getting my foot in the door at Marvel. I’d scripted a couple of fill-ins for editor-in-chief Jim Shooter—an Iron Man story, a Doctor Strange—but nothing had made it to print yet. 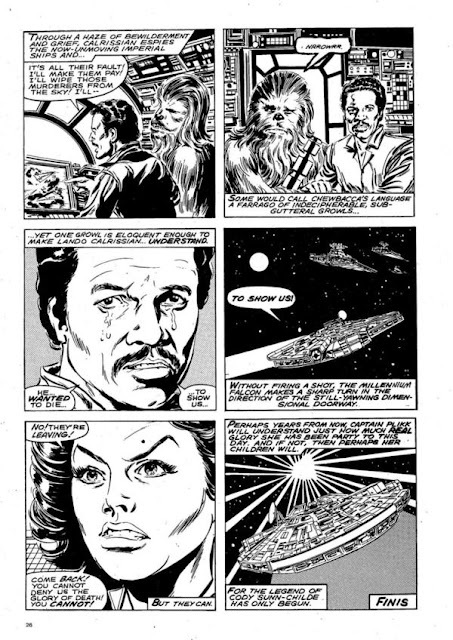 One day I got a call from editor Louise Jones (she’s Louise Simonson now) asking me if I wanted to write an issue of Marvel’s Star Wars monthly. I, of course, immediately said yes because a) it was Marvel Comics, the house that Stan and Jack built and b) I couldn't afford to turn down the work. I didn’t bother to mention to Louise that I had zero interest in Star Wars. I’d seen the first movie, liked it well enough, but just couldn’t grok what all the fuss was about. But an opportunity is an opportunity—and a good story is a good story, no matter what fictional universe it’s set in—so I got to work crafting a tale about Lando Calrissian and his encounter with a legendary rebel fighter, of my own creation, named Cody Sunn-Childe. Okay, okay: it wasn’t the most brilliant name for a character, but it meant something to me. And so did the story. As noted, I was new to comics, but I’d been writing—and, of course, reading—them long enough to know that the violent solutions presented in those magical, larger-than-life stories were often simplistic and, on occasion (maybe many occasions) stupid and harmful. 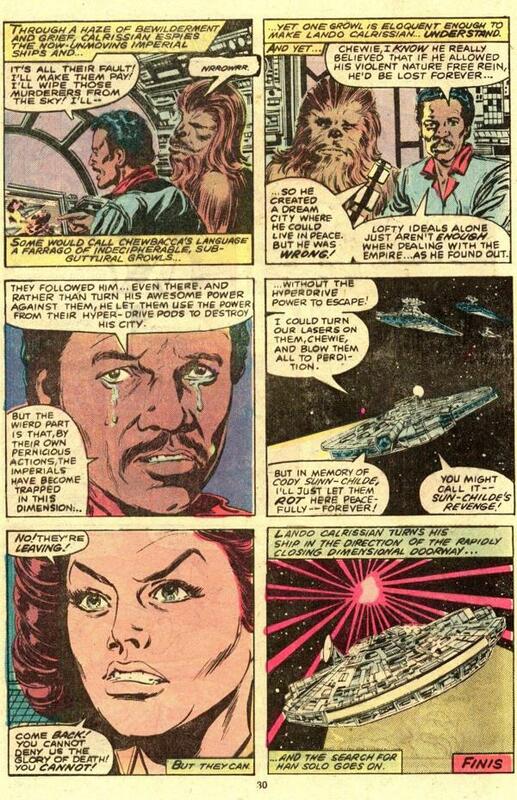 (I know we’ve gone over this ground before, talking about my IDW series The Life and Times of Savior 28 —but this Star Wars story predates even the original glimmer of that idea.) So I thought it would be an interesting touch to have Cody Sunn-Childe, this great warrior that Lando Calrissian idolized, go through a spiritual transformation and become a pacifist: a man, totally disgusted by violence, who was seeking a different way to live his life. Keep in mind that I didn’t belittle the Star Wars characters, or their beliefs, in any way: I was just presenting another point of view while keeping Calrissian and company true to their roots. They had their views, Sunn-Childe had his: let the readers decide who, if anyone, was right. 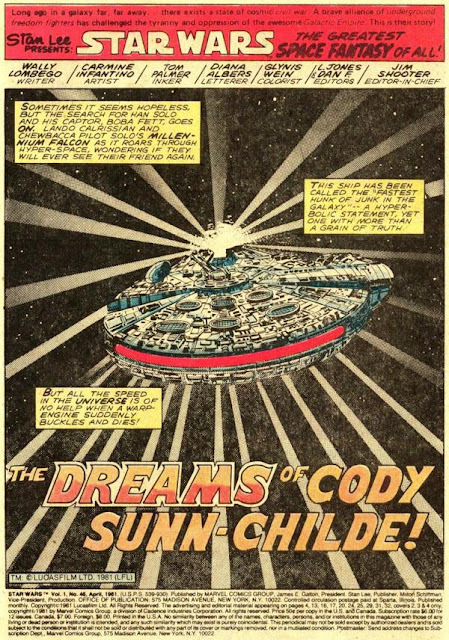 “The Dreams of Cody Sunn-Childe” wasn’t a brilliant piece of work by any means (it was better than the Buck Rogers version, but I was still too new, and too raw, a writer to do the idea justice), but I think it had something of value to say. And it was a “something” I wanted to pass on to my newborn son—which is why I named that new character after him. Louise made some changes to my plot along the way—actually, her overeager assistant editor, a curly-haired lad named Fingeroth, made the changes, and I’ve been giving the poor guy grief about it ever since—but nothing that altered the fundamental point of my story. The great Carmine Infantino drew the story, I wrote the final script (we were working “Marvel Style” in those days: plot, then art, then dialogue), Louise edited it and the book went off to the Lucasfilm reps for approval. To me, the Lucas people were the ones who were wrong; so wrong, in fact, that I took my name off the story, replacing it with the admittedly, and intentionally, ridiculous nom de plume Wally Lombego. Looking back, I’m amazed that I did it: I was in no position to jeopardize my working relationship with Marvel—or with any publisher. I had a career to build, a new family to support. But I simply couldn’t put my name on a story—dedicated to my son—that now meant exactly the opposite of what I intended. To her credit, Louise totally understood my position—and no one at Marvel ever gave me any grief about it. (In fact, not long afterwards I signed an exclusive writing contract with the company, so clearly no harm was done.) Of course I never wrote another Star Wars story, but the good news was—I didn’t want to.